As parents and teachers we recognize the importance that reading skills play in our personal and professional lives. We read on a daily basis, and as a matter of fact you are reading as we speak. Once your child hits the appropriate development level to being reading, putting together a reading plan can make later learning a much easier process. Children who partake in early literacy activities at home or at daycare, have more confidence than children who are not offered this resource. Premier Academy has the tools and resources to encourage reading, as we feel increased confidence will enable your child to socialize better with adults and other children at your childcare center. Check out these tips that ensure reading will be fun and easy! Road signs, billboards, magazines at the doctor’s office, shopping, reading is everywhere. While at the grocery store with your child, read the back of the cereal box, the magazine cover or the sale signs. Ideas live everywhere you and your child go, and actively engaging in conversation about them will expose your child to more information about the world. Your child’s ability to sit and listen for extended periods of time as you read, is an indication that your child is ready to start reading themselves! 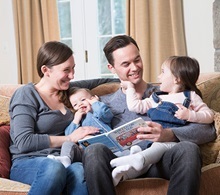 Reading to your child and having your child work on sight words and sounding out letters every day will help them have a longer attention span, better listening skills, and the ability to learn new concepts. These tend be more crucial when they start Kindergarten than being able to memorize the alphabet or count to ten. Don’t get us wrong, those things are important, but being able to pay attention, listen, and grasp new ideas makes what they’ll learn in Kindergarten a whole lot easier to understand. How you speak at home and how your quality childcare center teachers speak around your children helps foster a healthy vocabulary; which makes reading easier. Using rich language enables children to better express their feelings and experiences. Using words like enormous instead of big or outstanding instead of good, gives your child the vocabulary to express themselves in more specific ways. If you read your child’s favorite book to them time and time again, your child may begin to memorize the words. In order to make sure your child is actually learning the concept of reading and not just memorization, let your child read to you! They may know all of the words as they are in order, but make them pick out letters and sounds; pick out a word at random and have them sound it out. Even if they are not reading everything correctly, this encourages your child to share reading with you and others they may encounter. As you read with your child, keep them involved by asking specific questions about the story, and let them fill in the blanks. Try talking about the theme of the book, lessons the characters learned, and ask your child their favorite part. This not only ensures that they are reading words correctly, but that they are comprehending what they are reading. Reading material comes in many different shapes and sizes, some of which may be more accessible to a new reader. Even things you wouldn’t think of like video games, magazines, and comic books all provide opportunities for reading practice. Other suggestions for adding reading into your home: playing board games, closed caption on your television, and having your child help with grocery lists are just a few great ideas. Reading should be a choice, not a chore. Make sure there are a variety of books, magazines, and other materials available for your child to choose from. While it’s fine to make suggestions, children should be able to pick out stories on their own. Letting them control certain aspects of reading will help them view reading as fun and not just school work. Keep an eye on the reading level of the books your children choose. Let them stretch to the best of their ability, but be ready to help if they get discouraged. Premier Academy promises to offer the best childcare to foster a love of reading in all of our kiddos!